Have you neglected your feet for a while and noticed them become a little hard with obvious calluses? It’s time to give them that attention they deserve with the Lanaform Electric foot file. The Dolce is designed in an easy to hold egg shape meaning you can smooth your feet comfortably and steadily. 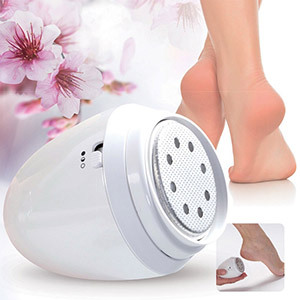 A real treat for your feet this Dolce pedicure device will leave you with naturally soft feet which are smooth to touch. Because we spend so long standing on our feet every day they must adapt to cope with this strain which often leads to them getting tough hard calluses or dry patches. The Lanaform Dolce is ideal for damaged, dry and rough feet because this exfoliating device has been designed to smooth over the skin of your feet and heels gently making them feel new again. Thanks to its rotating abrasive disk, dead skin on your feet will be easily eliminated and you will be left with a beautifully soft layer of skin. Treat your feet to an indulgent experience today with the Lanaform Dolce pedicure device – they deserve it!